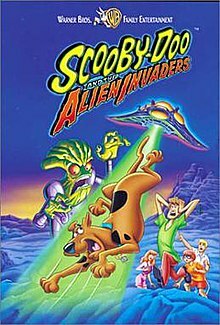 Scooby-Doo and the Alien Invaders is a 2000 direct-to-video animated comic science fiction mystery film. It is the third direct-to-video film based on the Saturday morning cartoon series by Hanna-Barbera Cartoons, Inc. The film was produced by Warner Bros. Animation (though it has a Hanna-Barbera logo and copyright notice at the end). Unlike the previous films, it has a lighter tone since the real monsters are friendly and the disguised humans are the primary antagonists. It is the third of the first four Scooby-Doo direct-to-video films to be animated overseas by Japanese animation studio Mook Animation. It was the last film to feature Mary Kay Bergman as the voice of Daphne before her death in November 1999, and the film was dedicated to her memory. The gang is driving through a desert in Roswell, New Mexico when a sandstorm forces Shaggy to make a wrong turn onto government property. Soon after, a UFO causes Shaggy to crash the car, and the gang find themselves on the outskirts of a small town. While Scooby and Shaggy stay with the van, Fred, Daphne, and Velma go to a local diner to ask for directions. Shaggy and Scooby then see a mythical animal called a jackalope , which takes their last Scooby Snack. Scooby and Shaggy chase the jackalope into a cave, where they encounter aliens. They flee the cave and run into the diner in a panic. Scooby and Shaggy tell the people inside the diner about their encounter, but the gang is skeptical. The waitress, Dottie, says that multiple people claimed to have seen aliens, but that she has never seen them, but she has noticed strange lights and sounds at night. The chef, Sergio, says that a month earlier local cattle vanished without a trace, after which many people left town. A man named Lester, who claims to have been abducted, believes Scooby and Shaggy. He also claims to have pictures from his abduction; however, they turn out to be nothing more than paintings. He then tells the gang that ever since the installation of SALF (Search for Alien Life Forms, similar to SETI) satellite dishes, there have been numerous reports of UFO sightings and disappearing livestock. The gang stays overnight at Lester's home; however, its lack of space forces Scooby and Shaggy to sleep on the roof. Later that night, they are abducted. The aliens try to examine the two, but Scooby is able to free them. After being cornered by the aliens while trying to escape, they pass out. They are awakened in the middle of the desert by a hippie photographer named Crystal, and her golden retriever, Amber. Shaggy and Scooby immediately fall in love with them, and when they meet up with the rest of the gang at the local diner, they are still so lovestruck that they are not even hungry, which shocks Fred, Daphne, and Velma. The gang sets out to find a mechanic to repair their van when they meet Steve, Laura, and Max, who work for SALF. Fred, Velma, and Daphne take a tour of SALF facilities, while Crystal and Amber take Scooby and Shaggy to try to find and photograph the jackalope. During the tour, Velma grows suspicious after noticing dried mud on the SALF crew's boots (which would not be found in the middle of the desert), and a large amount of oil, (which Max claimed was for the satellite dishes, but is the wrong kind). While trying to find the jackalope, Scooby, Shaggy, Crystal, and Amber are forced to leave the area by two government agents. However, Crystal reveals that she is an undercover government agent sent to investigate the aliens, and the four enter a nearby cave. Lester takes the rest of the gang to a canyon where Velma believes a seasonal river runs so they can investigate. The canyon proves to be dry, but they find tire tracks, and follow them into a cave full of mining equipment--the same cave Scooby and Shaggy are in. Both parties find a massive amount of gold in the cave's walls before being found and chased by aliens. Fred, Velma, and Daphne are captured, but Shaggy, Scooby, Crystal and Amber escape. The aliens reveal themselves to be the SALF crew, and they explain that they stumbled onto the cave while searching for a new location for another SALF dish. Since it was on government land, they decided to keep the secret for themselves, using alien disguises and two fake government agents to keep people away. After the fake agents corner Scooby, Shaggy, Crystal, and Amber, Crystal and Amber reveal themselves to be real aliens, from a planet 20 light years away. They disguised themselves as hippies because the only information they had about earth was from watching 1960s television broadcasts. The UFO that ran the gang off the road was actually Crystal and Amber's spaceship. The gang, Crystal, and Amber manage to stop the SALF crew from escaping and tie them up. The SALF crew and their accomplices are arrested, and Crystal and Amber return to their home planet after a heartfelt goodbye. Shaggy and Scooby are heartbroken, but a box of Scooby Snacks helps them forget about their sorrows. As the gang drives off, the jackalope reappears and looks to the sky as Crystal and Amber's ship passes one last time. In a post-credits scene, Scooby-Doo scares the audience in an alien costume. Scooby-Doo and the Cyber Chase was released on October 9, 2001. ^ "Scooby-Doo and the Alien Invaders". Retrieved 2 November 2014.